This festive Low-Sugar and Gluten-Free Cranberry Apple Crisp is made with low-calorie natural sweeteners and it’s low-glycemic, gluten-free, South Beach Diet friendly, and will be vegan if you use coconut oil! Use the Diet-Type Index to find more recipes like this one. 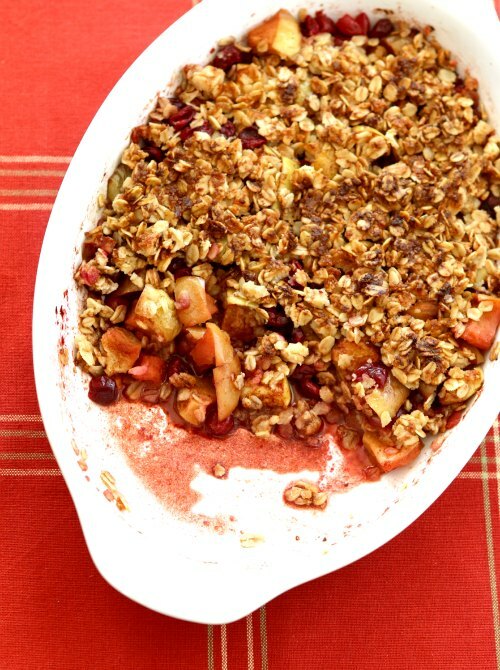 Click here to PIN Low-Sugar and Gluten-Free Cranberry Apple Crisp! 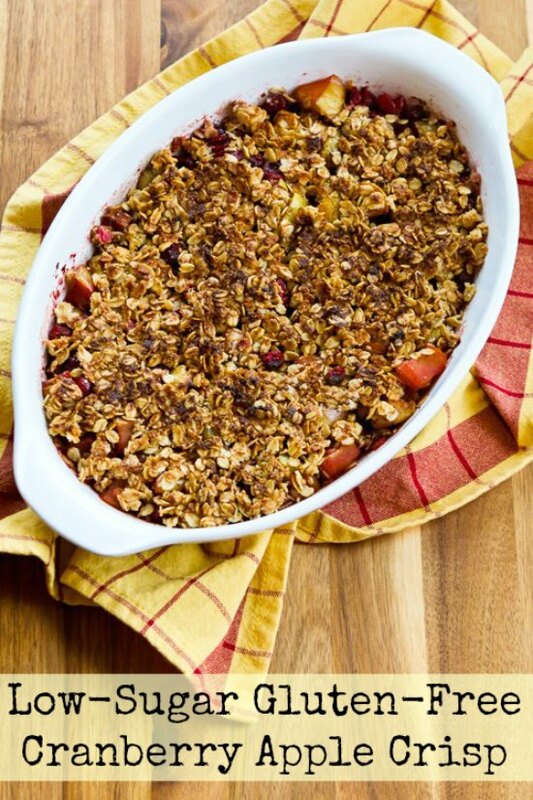 Today I’m spotlighting Low-Sugar and Gluten-Free Cranberry Apple Crisp! The original inspiration for the recipe was a huge bag of cranberries I bought to make my favorite Fresh Cranberry Salsa for Thanksgiving, and I was frankly surprised at how much I loved the combination of fresh cranberries and apples. I had to make this a couple of times to get it just right, and I might have even loved it a little too much (apple crisp for lunch, mmmm.) I’ve never been that much of a fresh cranberry fan, so even if you might think cranberries are not really your thing, be open minded about this one! I used a combination of Stevia-in-the-Raw Granulated Sweetener and Swerve Sweetener for the final version of this, and when I tried it out on some dinner guests who are used to sugar-sweetened baked goods, it was definitely a hit. You don’t have to use two kinds of sweetener to make it, but personally I think the flavor is better with a combination. You could also use a little brown sugar to replace some of the sweetener if you don’t care all that much about the low-sugar thing. Of course this recipe has natural sugar from the apples and the cranberries so it can’t ever be sugar-free, but I thought this was really good for a low-sugar dessert. Make the crisp topping first. Combine the oatmeal, almond flour, Stevia-in-the-Raw Granulated Sweetener and Swerve Sweetener (or use a sweetener of your choice). Then stir in the melted coconut oil (or butter or trans-fat free margarine) and the vanilla. I used Honeycrisp apples, which I think added to the flavor. If you have an inexpensive Apple Corer and Slicer like this one, it makes cutting up the apples a lot quicker. I kept the skin on and cut the slices into chunks. Combine the apple pieces, cranberries, Stevia granulated sweetener, Swerve sweetener, and cinnamon. Spread the mixture out into a gratin dish that you’ve sprayed with non-stick spray. Spread the crisp topping over the fruit, using a rubber scraper to spread it completely over the top. Bake at 400F/200C for 35-40 minutes, or until the mixture is cooked through and bubbly. Serve hot (with ice cream or whipped cream if you’re feeling indulgent.) It disappeared pretty quickly at my house! This festive Low-Sugar and Gluten-Free Cranberry Apple Crisp is made with low-calorie natural sweeteners, great for any occasion. Preheat oven or toasted oven to 400F/200C. Spray a medium-sized gratin dish with non-stick spray. First make the crisp topping. (or Almond Meal will probably work), Stevia-in-the-Raw Granulated Sweetener, and Swerve Sweetener in a small bowl. Melt the coconut oil, trans-fat free margarine, or butter and mix into the oatmeal mixture, then add the vanilla and combine again. Combine the apple pieces, cranberries, Stevia, Swerve, and cinnamon in a bowl and then spread it into an even layer in the gratin dish. Spread the crisp topping over the fruit, using a rubber scraper to spread it completely over the top. Bake 35-40 minutes, or until the fruit is bubbling hot and the crisp topping is starting to brown. Serve hot. (This is delicious with a little bit of vanilla ice cream or whipped cream if you’re feeling indulgent. )Apple Cranberry Crisp will keep in the fridge for several days and can be reheated in the microwave. I first made this with a combination of Stevia-in-the-Raw Granulated Sweetener and Swerve Sweetener but now I might useLakanto Golden Monkfruit Sweetener instead of swerve. If you don’t want to buy two sweeteners, you can make it with just one or the other of those sweeteners, or use another sweetener of your choice, but I think using a combination of sweeteners gives best flavor when you’re using a low-calorie sweetener. Recipe created by Kalyn with inspiration from Low-Sugar Flourless Apple Crisp. If you’re making this Low-Sugar and Gluten-Free Cranberry Apple Crisp for a low-glycemic diet or the South Beach Diet, it’s important to use an approved sweetener, since the apples and cranberries have natural sugar. I’m guessing this is probably a “once-in-a-while treat” for Phase 2 for South Beach Dieters. It’s probably not low enough in carbs for most low-carb diet plans. Kalyn, just read your post about that other significant birthday – excellent! I'm going to keep a copy of that list handy to refer to – I like your attitude! This looks great! I love mixing fresh cranberries with apples in my baking. I don't use alternative sweeteners – the chemical ones because of well the chemicals and the natural ones like stevia because I don't like the flavor (everyone tastes things differently, and many people love the flavor)- but I make everything with less sugar than called for, which is what I'll do with this lovely crisp! Happy birthday chica!! I hope you had a lovely day yesterday and many more in the years to come!! This crisp looks like such a lovely way to celebrate! I love dessert and happy to try your gluten free crisp. I love all the ingredents. Remember, you are not your chronological age. Your biological age is 15 years younger. Celebrate by kicking up your heels and go dancing…or at least dance in your kitchen. Thanks Jeanette. I hope I will make it to BlogHer Food, so maybe I will see you there. Maureen, sounds like you have a wonderful attitude about age! Hope you enjoy the apple crisp. Your crisp will be perfect to eat while we sit outside and watch the Christmas boat parade go by.